I've become a bit obsessed. While I was visiting friends in the chilly Northeast, I tried my hand at making chicken and dumplings. I've made it three times since and I'm STILL not tired of it. The title of this recipe might confuse folks not familiar with the American Southern version of dumplings. My British friends might expect a pan-fried, chicken pot sticker, others might think they were going to get a Chinese steamed bun object. Southern dumplings are a lazy man's Southern biscuit. They are incredibly easy to make and in truth, incredibly difficult to screw up. 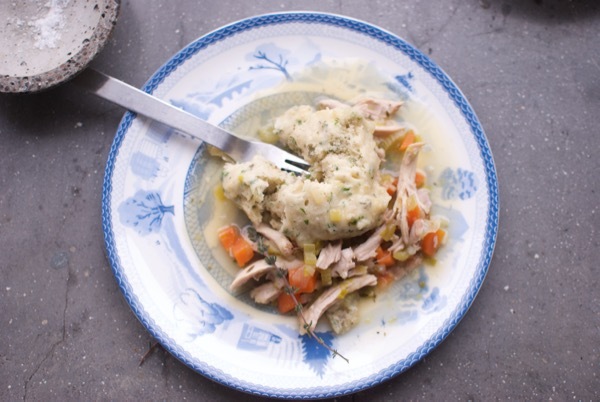 The chicken stew comes together easily and is available to a million variations. Once the stew is done cooking you just drop the dumpling batter on top of the stew in the last five minutes and cover. The dumplings steam into pillows of goodness that sop up all the gravy from the stew. I have made the dumplings with milk, and then also tried making them with broth. I didn't notice a discernible difference, although the broth version gave me a more-watery batter. Kitchen was generously loaned from the collection of Mr. Benjamin Mason. I think it would be great to substitute carrots for portobello mushrooms, cream and kale. You could also add ginger, scallions and bok choy for an asian version. Bacon and red wine would make for more of a bourguignon version, or ham and dijon mustard, the list could go on and on. 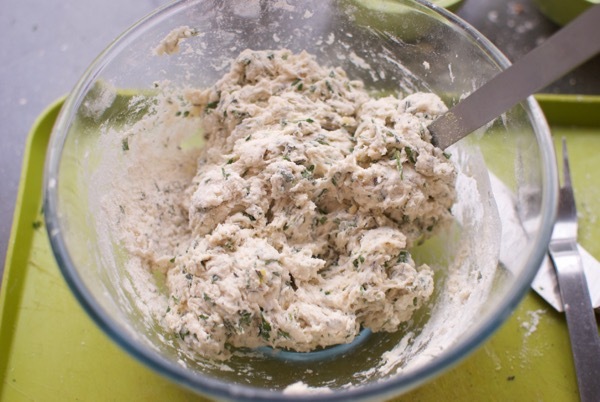 The dumplings as well, I've added chives and parmesan, chopped fresh herbs de provence, lots of flat leaf parsley. I call this recipe a wonderful fridge cleaner, in that you could use whatever you have on hand and not go too far wrong. 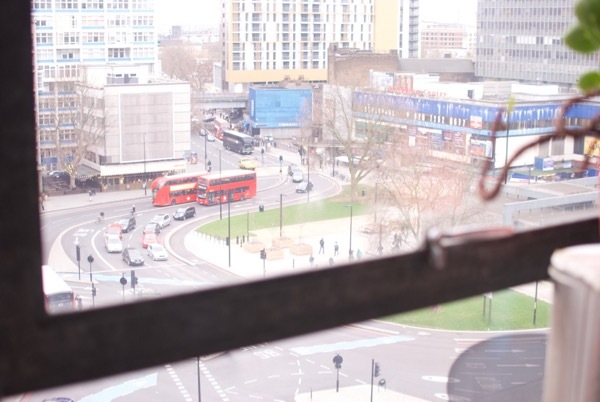 This version is pretty classic, and great for these blustery late Winter evenings, when you feel so sick of cold rain and wind that you could weep. Sticking your face into a pot of the above will help immensely. 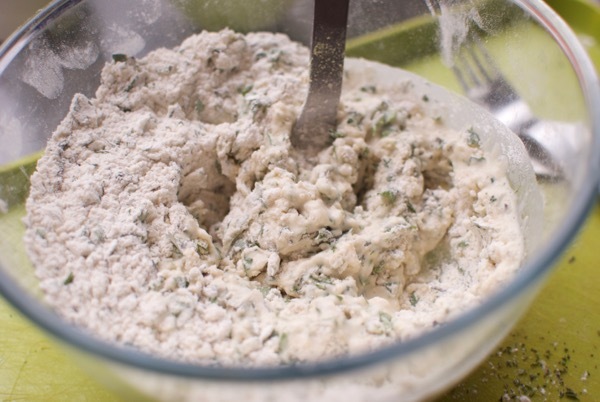 Whatever fresh herbs or grated hard dry cheese that you wish. The ideal pan for this recipe is a dutch oven, but any deep pan would do. Heat a table spoon of sunflower (or veggie) oil, until very very hot. Start by patting the chicken thighs dry and sprinkling them liberally with salt and pepper on both sides. Brown both sides of chicken thighs in batches until they are golden brown. Remove from the pan and pour off some of the fat rendered. Add the onion, leeks, and celery to the pan with a good dash of salt and pepper. Sweat the veggies until they are translucent, about 10 minutes, but don't let them brown. Add the carrots and cook for another 2-3 minutes. Add the knob of butter, and let it melt. Add about a tablespoon of flour and stir through the veggies. Add the wine and stir. (This is where you could add the mustard if you wished.) 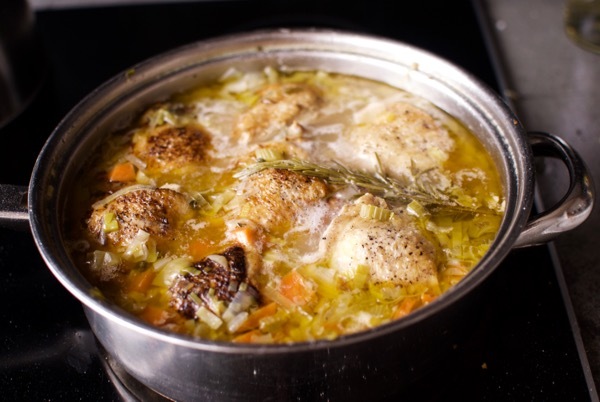 Put the chicken back in the pan and add the stock. There should be enough liquid to nearly cover the chicken. Reduce the heat to medium low, cover pan and let simmer on low for 40 minutes. Remove the chicken from the pan. Let the chicken cool enough to handle, and continue to simmer and reduce the liquid with the cover off. Remove the chicken skin, and shred the meat off the bone. Return the chicken to the pan and keep simmering. 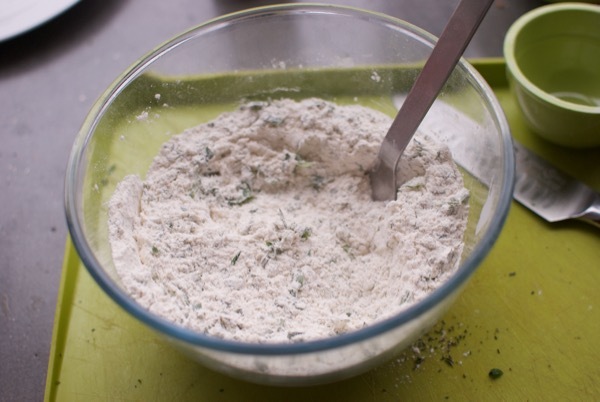 Stir the flour, baking soda, baking powder and herbs together. Add the melted butter and stir again. Finally add the liquid and blend enough to make a smooth batter. 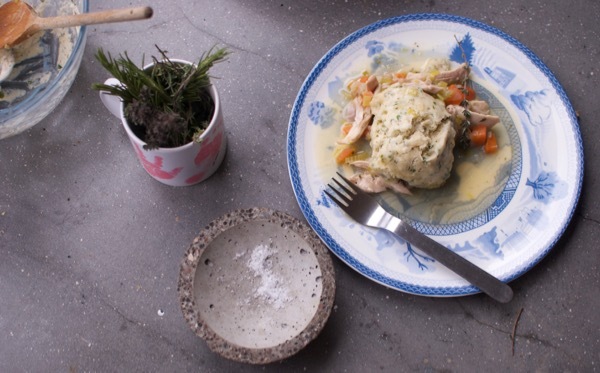 Take a large table spoon and drop egg size dumplings on top of the stew until the top is totally covered. 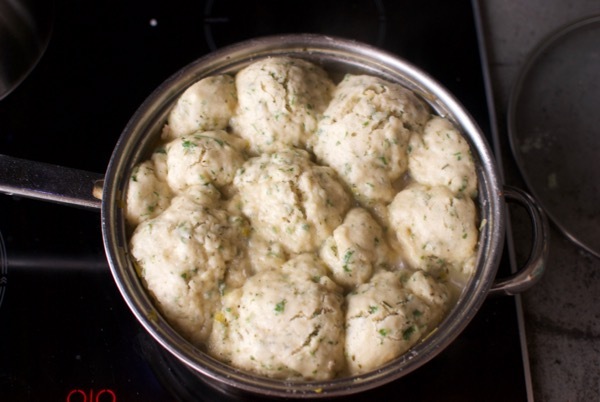 Replace the pan lid and cook for 5-8 minutes or until the dumplings are cooking into fluffy pillows all the way through. You could prick one with a toothpick to check. Serve with a big salad!